In Silver Spring, lifestyle is part of the landscape. The neighborhood boasts a vibrant mix of restaurants, music, art, and entertainment venues. Central to everything, from rustic brunches to urban butchers. From local cafes to downtown hot spots, dining in Silver Spring is second to none. Whether diving into a plate of your favorite oysters at All Set, or sharing cocktails and small bites at 8407 Kitchen Bar, there's always a dish or delicacy waiting to be discovered. Catch a screening of a classic, or hit the Fillmore to discover a true up and comer. Grab an espresso at Bump 'n Grind, see a show at the AFI Silver Theatre, or simply take in the walkable neighborhood around you. No matter the day, new sights, sounds, and scenery are yours to discover in Silver Spring. Fresh flowers and local produce are yours to pick up at the market. 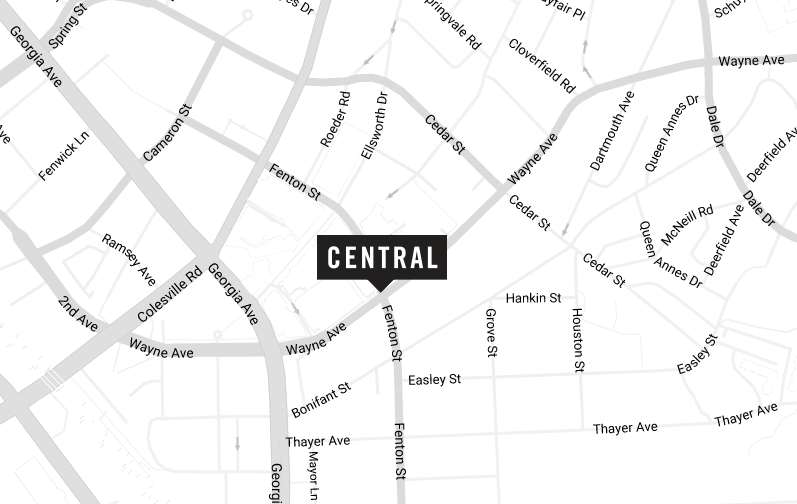 The freshest finds in both food and fashion are right out your door at Central. From seasonal vegetables and artisanal cheeses at FRESH FARM market, the local weekend farmer's market, groceries from Whole Foods, and everything else at the Downtown Silver Spring Shopping Center, incredible finds have never been so convenient. Get out and discover endless inspiration close to home. Explore the Silver Spring Arts and Entertainment District, have a picnic at the Fenton Street Urban Park, or go pick up a book to get lost in at the Silver Spring Library. Whether you want to indulge your creative side, dine al fresco with a friend, or relax reading - Silver Spring offers endless options.